When people ask me what my son with food allergies eats, I typically tell them he eats like a Vegan…a Vegan who eats meat! Before my son was diagnosed with food allergies, I knew very little about the subject. My knowledge was limited to children who experienced life-threatening, anaphylactic reactions to things like nuts. Earlier this week, an article was released which found that one in twelve children are affected by food allergies. The article is based on a study published in the journal entitled Pediatrics, and it’s aim is to create awareness around the subject. As a mom of a child with food allergies, I’m constantly educating those around me. Just yesterday, my son’s teacher asked me if he could ever have a piece of cake or a cookie that was brought in for a child’s birthday party. I gently explained to her that without knowing the ingredients of those items, he would not be able to eat them. There are many misconceptions about food allergies. Some of the things I’ve heard include the following: “He’ll outgrow them.” “He’s not really allergic…just sensitive.” “A little won’t hurt him.” While I do have hope that he will outgrow his allergies, and I wish he wasn’t truly allergic, a little will hurt him. I’ve learned to get very creative at home. My son eats allergy-free versions of his favorite foods including vegan pizza, vegan macaroni and cheese, sorbet, and almond milk yogurt. Our struggle is eating out. Unless I’m eating at a Vegan restaurant (ironically my son is not a Vegan), the only way I can be certain that my son is safe is if I can look at the ingredients of foods or speak to the head chef at a restaurant. 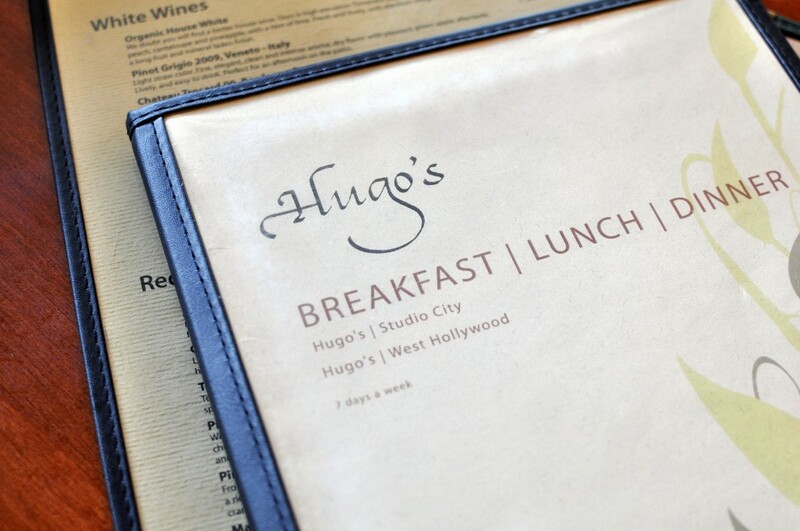 A few weeks ago, I frequented Hugo’s, a restaurant that has been serving LA locals and visitors for 30 years. The restaurant has evolved over the years and is committed to a “sustainable ‘stealthy healthy’ whole food concept” where traditional dishes co-exist with incredible gluten-free, vegan dishes. The restaurant has stayed true to some of it’s original dishes such as it’s famous Pasta Mama, but has evolved to offer a menu of dishes free from white flour, table salt, and oil. 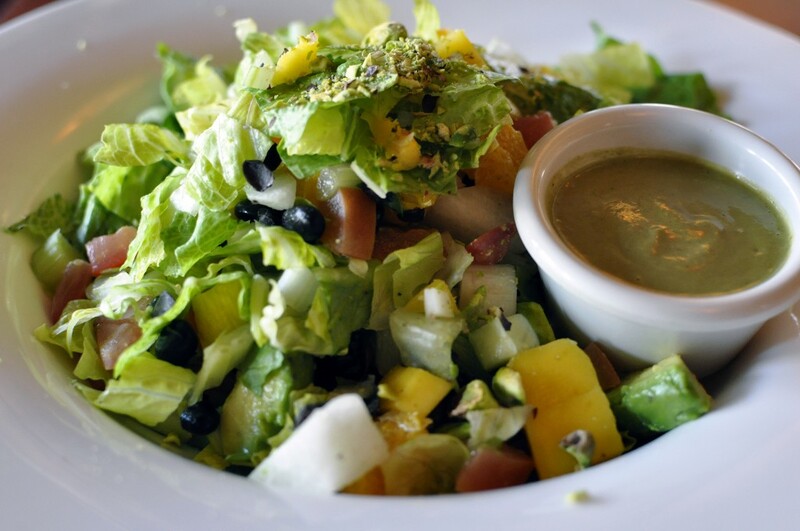 Of note, the restaurant’s sauces and dressings are vegan and gluten-free…but you won’t even notice! What’s unique about the restaurant is it’s appeal to a diverse group. Gluten intolerant? You’ll find a variety of dishes to suit. Vegan? Just tell the chef. And if you’re a meat eater, like my husband, the restaurant won’t disappoint. In our family, we have a food allergic child, a child who doesn’t suffer from food allergies, a mom that doesn’t eat red meat, and a dad who does. It’s perfect! Because I like to be adventurous, I decided to start with a Mango/Avocado Salad, had their Vegan Mac & Cheese as an entree, and finished with their Sweet Chipotle Sundae. The Mango/Avocado Salad was deliciously light and tasty. It combines sweet and savory flavors and is a perfect summer salad (I’m hoping they bring it back!). If you’re not a vegetarian/vegan, add some chicken or shrimp for a protein boost. Their vegan take on a classic kid’s dish was unlike any I’ve tasted. 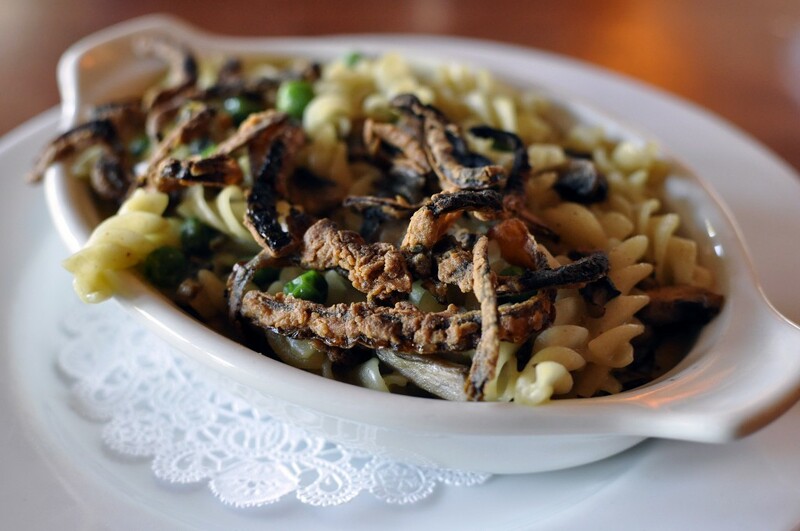 Fusilli pasta is combined with garlic, sliced mushrooms and sweet peas in a creamy cashew and sunflower cheese sauce, topped with crispy onions. The dish is creamy, tasty, and exceeded my expectations for a vegan dish. While I still prefer my macaroni and cheese with cheese (and milk! ), this is a delicious alternative for those who choose to live dairy-free. The Valley Vegan called Hugo’s Sweet Chipotle Sundae, “The Best Thing I Ever Ate” and that’s not far from the truth. You’d have to be a bit adventurous and put aside your traditional notions of what dessert is…but the result is something unique, creative, and simply amazing. The restaurant makes (yes, that’s right!) Avocado ice crème (or you can ask for Tahitian vanilla) and tops it with sweet chipotle sauce over fried plantains and corn bread. The dessert is garnished with chopped candied pistachios. This is definitely the most savory dessert I’ve yet to taste but it’s incredible. The flavors are rich and distinct. My hats off to the chef who dreamed up this creation. 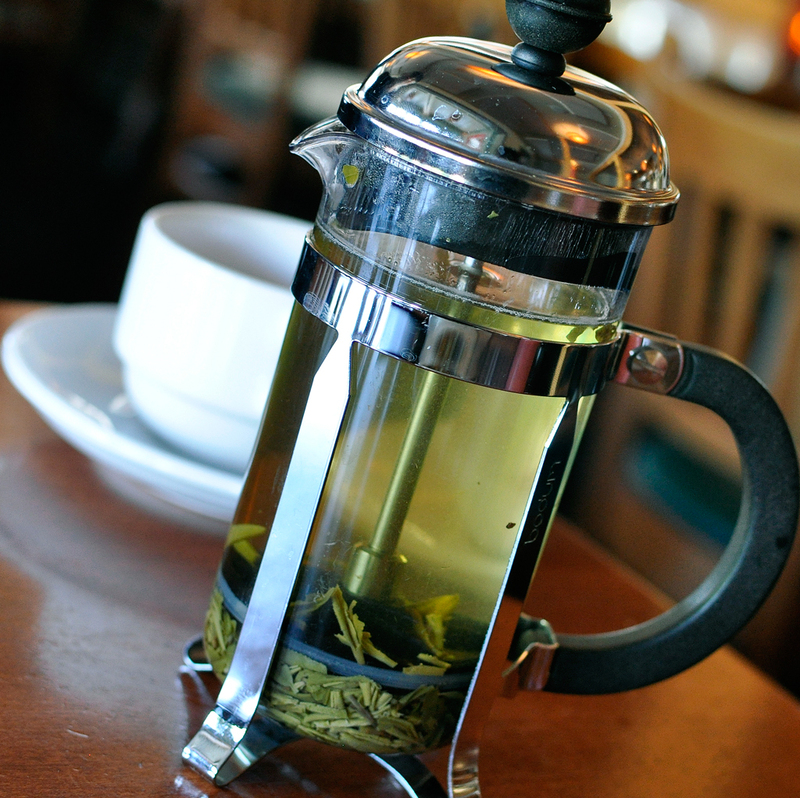 Being that I’m a tea drinker, I found the fact that Hugo’s offers a very expansive tea menu to be very appealing. Selections include green, black, chai, herbal, spiced, oolong, white, and Pu Erh. Hugo’s is set to open a third LA location in Agoura Hills in August. 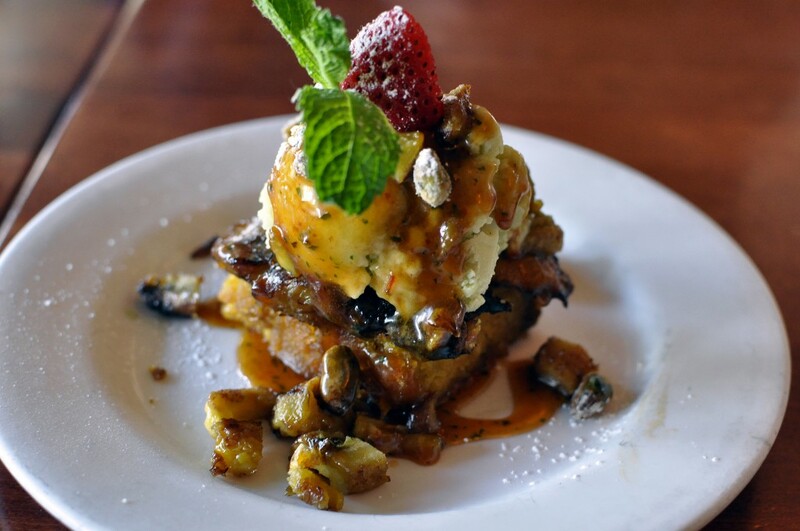 My only question is, when are you bringing your amazing dishes to the OC? No compensation was received for this post. I was invited to lunch at Hugo’s which helped facilitate this review. Photo Credit: Rockin’ Mama. All rights reserved.